A globe style valve, including a plug that opens and closes allowing more or less water to flow through it, according to the amount and direction of the positioning force. The most significant positioning forces are due to the actuator pressure element and the Power Spring. The actuating pressure element, such as a diaphragm or bellows, transforms the pressure of the refrigerant into a positioning force acting on the valve stem. Most Metrex valves "open on increasing pressure". Alternately, valves can be configured to "close on increasing pressure" and are commonly designated "reverse acting". The power spring develops a counterforce opposite in direction and equal in magnitude to any force that compresses the spring. The strength of the spring and its initial compression can be varied to give the valve the desired opening characteristics. Power springs can be mounted in a spring housing, inside the bellows or both. As the pressure increases and the valve moves to a more open position, the spring is further compressed and the spring force increases. The sum of the positioning forces is equal to zero when the valve is in a steady-state position. If changes occur within the system, equilibrium is upset. 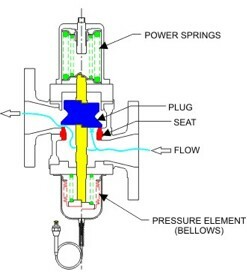 The valve responds by changing position until the spring force again equals the force from the pressure element and equilibrium is re-established. In a typical refrigeration application, as the "load" on the chiller increases, the pressure and temperature of the refrigerant will rise, causing the valve to open and the water flow to increase. Due to the regulating action of the valve, the flow of cooling water through the condenser keeps pace with the load on the refrigeration system and the refrigerant head pressure is maintained within a relatively narrow range.